Coolum Beach is located on the Sunshine Coast in the Australian State of Queensland and is approximately 120 kilometres north of Brisbane, the State capital. If travelling by car from Brisbane it will take between one to one and a half hours. Coolum Beach is located just 15 minutes south of Noosa. 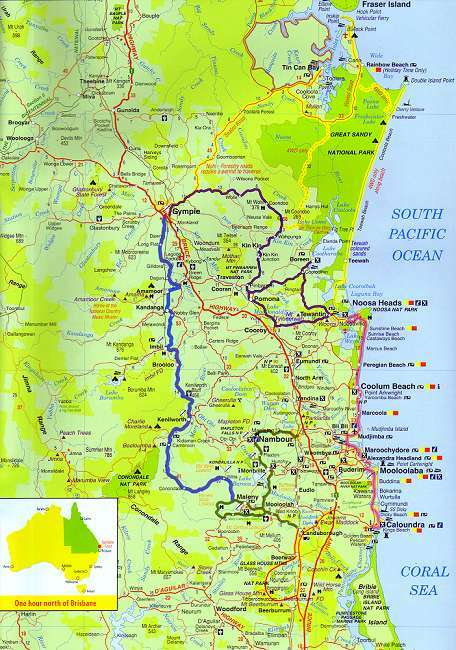 The closest airport is Sunshine Coast Airport at Maroochydoore (just 10 minutes drive south). There are direct flights to Maroochydore from Brisbane, Sydney and Melbourne. Virgin Airlines operates daily direct flights from Sydney and Melbourne. For more information visit www.coolum.com.au/virginblue. The trip from Sydney takes around 1 .5 hours, from Melbourne takes around 2 .5 hours. From Brisbane the trip is around 30 minutes. For more on How to Get Here, including Airlines. Airport Transfers & Rentals Cars go to our How to Get There page.